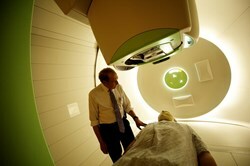 Children’s Hospital of Philadelphia researchers report effective radiation option without exposure to healthy organs. For patients with neuroblastoma, proton beam therapy offers precise targeting with less radiation exposure to healthy tissue. Proton therapy, using high-energy subatomic particles, may offer a precise, organ-sparing treatment option for children with high-risk forms of neuroblastoma. For patients in a new study of advanced radiation treatment, proton therapy spared the liver and kidneys from unwanted radiation, while zeroing in on its target. Neuroblastoma, the most common solid tumor of early childhood, strikes the peripheral nervous system, usually appearing as a solid tumor in a young child’s chest or abdomen. Pediatric oncologists have an arsenal of weapons against neuroblastoma, but high-risk forms of this cancer present a particular challenge, often frustrating conventional treatment from the start or recurring in a resistant form. Co-authors of this study were Robert Lustig, M.D., Zelig Tochner, M.D., and Stefan Both, Ph.D.; like Hill-Kayser, all are from the Department of Radiation Oncology of the Perelman School of Medicine at the University of Pennsylvania. Co-authors Anne Reilly, M.D., Naomi Balamuth, M.D., Richard Womer, M.D., John Maris, M.D., Stephan Grupp, M.D., Ph.D., and Rochelle Bagatell, M.D., are from the Cancer Center for Children at CHOP. About The Children’s Hospital of Philadelphia: The Children’s Hospital of Philadelphia was founded in 1855 as the nation’s first pediatric hospital. Through its long-standing commitment to providing exceptional patient care, training new generations of pediatric healthcare professionals and pioneering major research initiatives, Children’s Hospital has fostered many discoveries that have benefited children worldwide. Its pediatric research program receives the highest amount of National Institutes of Health funding among all U.S. children’s hospitals. In addition, its unique family-centered care and public service programs have brought the 516-bed hospital recognition as a leading advocate for children and adolescents. For more information, visit http://www.chop.edu.